Preciosa Czech glass seed bead, size 11/0 opaque white with red and blue pinstripe, approximately 2mm Czech glass rocaille bead. This three colour combination produces an interesting visual effect from a small distance (the colours meld/mix), but becomes sharp and distinct on closer scrutiny. 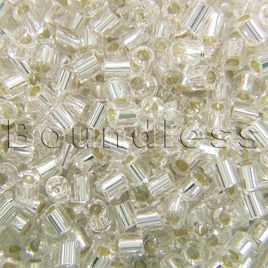 All the striped Czech glass beads of this type have very strong cultural significance to many tribal peoples from a number of distinctly separate cultures.